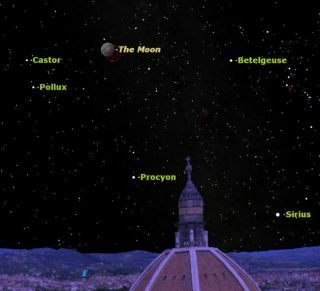 The eclipsed moon, illustrated for Dec. 31, 2009, rides high above the Cathedral of Santa Maria del Fiore in Florence, Italy. Eclipses of the moon occur twice a year, on average. Eacheclipse is visible only on the half of the Earth turned towards the moon at thetime the Earth's shadow falls on the moon. There will be a partial eclipse of the moon on New Year'sEve, Dec. 31. Because of its timing, it will not be visible in North and SouthAmerica, but will be visible over most of Europe, Africa, and Asia. The event will also mark the second full moon of the monthin North America, thereby garnering the title of "bluemoon." Unless unusual atmospheric circumstances come into play ? suchas widespread dust from a volcano ? the moon will not be blue, however. Since it is a partial eclipse, the moon will just brushpast the darkest part of the Earth's shadow, never becoming totally immersed.It will, however, be deep enough into the shadow that shading and reddish colorshould be visible. Even though the eclipse isn't visible for most of us inNorth America, it's still possible to enjoy this event through astronomysimulation software like StarryNight. An armchair skywatcher can use this software to view the eclipsefrom any point on Earth. As the sun sets in the southwest, the full moon rises inthe northeast. At 6:17 p.m. local time Friday the moon begins to enter theEarth's shadow, though it is undetectable at first. At? 7:52, the moon entersthe darkest part of the Earth's shadow, called the umbra. Maximum eclipse is at8:23, and the moon leaves the umbra at 8:53. The last traces of the shadow aregone by 10:28. Observers in other parts of the Old World will have to makeadjustments for their local time zones. Australians may catch a glimpse of theeclipse just before moonset at dawn on Jan. 1. Again, the eclipse is notvisible from the Americas.